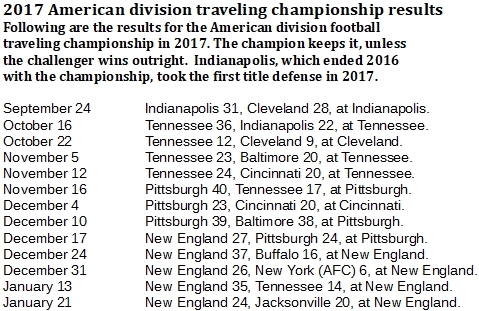 The New England Patriots are the best team historically with the American division of the pro football traveling championship, and they also were the best team of 2017. 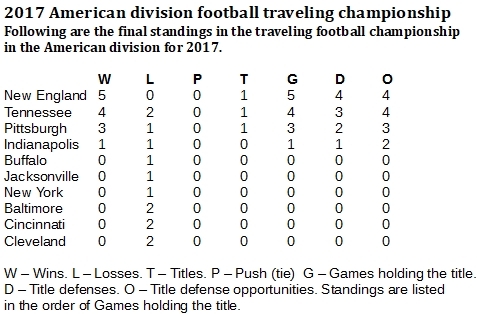 Just as the New England Patriots are, by far, the leading pro football team in the universal traveling championship, they also are by that much the best team in the American division traveler. 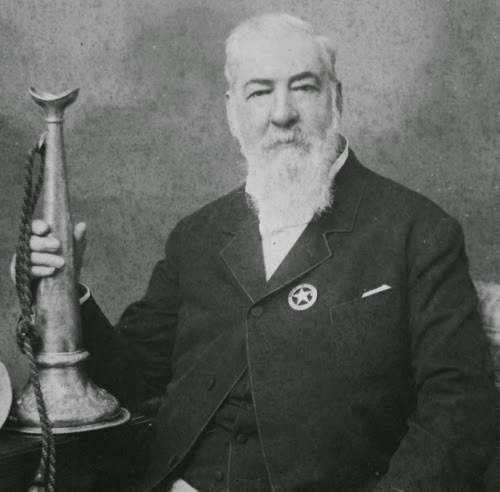 After all, their top competition in the larger version is, in fact, made of American foes – the Pittsburgh Steelers and the Indianapolis Colts. Looking at the league-wide traveler through 2017, New England has the most wins with 57, followed by Pittsburgh (32), then Indianapolis and the Green Bay Packers (22 each), followed by the Rams and Denver Broncos (20 each). Thus, three American teams are doing at least as well as any National team. And the top of the historic standings for the American side looks a lot like the top of the league-wide historic standings. On the American side, the top winner is New England (54), followed by Pittsburgh (34), Indianapolis (28), Denver (20) and Baltimore (19). For 2017, as historically, the top team is the Patriots, who won all five games they played and kept the prize all the way to the Super Bowl and up to the start of the 2018 season. The Patriots beat the Steelers, 27-24, in Pittsburgh on Dec. 17 to claim the title, and they never let it go.